One of the birds has been caught on camera lifting a pack of bacon out of a shopper’s trolley in Elgin. 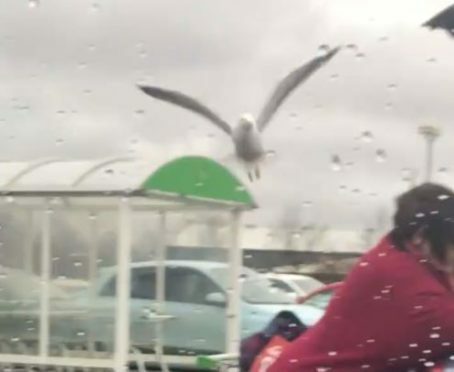 The crafty creature waited until the woman’s back was turned before swooping in for the steal in the town’s Asda car park. Footage of the theft had been viewed more than 13,000 times online yesterday within a day of the incident – but it is understood the culprit is still at large. Last night, it was revealed that business leaders in the area have now approved a laser project in an attempt to push the birds out of Elgin’s town centre with the first sweeps due to take place in the coming weeks. However, war continues to be waged at the Edgar Road retail parks with the gulls known to mass together on the roofs of shop units and on abandoned ground near the railway line. It is understood that shoppers at Asda have now been warned to bury appetising snacks at the bottom of trolleys to avoid being surprised. Last year, Elgin’s business improvement district (Bid) promised action against the birds in order to encourage them to leave the town in favour of a more natural habitat. Yesterday, Elgin City South councillor John Divers, who is a director of the Bid, revealed laser treatment had now been given the go-ahead. He said: “It’s due to start very soon. Discussions have taken place with a firm who have used it very successfully in Aberdeenshire so we’re going to see if it can work here too. Moray Council has previously considered deploying drones in the conflict to oil eggs belonging to the feathered foes, which are protected by legislation, to prevent them from hatching. However, the local authority decided against action due to the expense and it not being legally obliged to act against the birds. Signs have been posted in town centres and on residential estates across the region to tell people to stop feeding them.